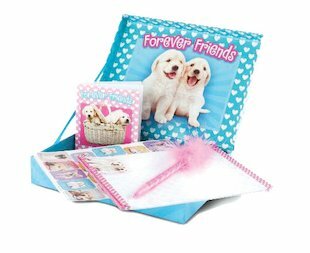 Show your besties that they’re for life with the cutest pair of puppy pals, who demonstrate just how close good friends should be! Tumbling out of baskets and snuggling up on rugs, these lovely Labradors will give a cosy cuddle to all your lucky letter recipients. Tell your friends that they’re forever with greetings that are softer and sweeter than the rest! Box includes 24 sheets of letter paper, 24 envelopes, sticky notes, feather pen and sticker sheet.